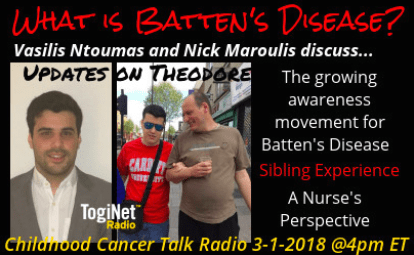 Nurse and family confidante Nick Maroulis, and brother of Theodore Vasilis Ntoumas join us to discuss Batten disease and the effects of fatal, rare, pediatric disease on the family and in a country where support is so difficult to instate. Nick comes to us from Greece, while we speak with Vasilis who now lives and works in London. Theodore is a living miracle, still active in his life and a source of love and inspiration to those who know him. Research into cures for this deadly, genetically caused disease is still in its infancy, and the family–in particular Theodore’s mother Christina, strives to create greater awareness and a stronger network of concern around the world with their website, www.theodoresmiracle.com. This conversation is a wonderful update to our original show with Theodore’s mother Christina, with Nick, in April of 2017. Theodore’s brother Vasilis, who talks to Theodore every day via Skype, adds a beautiful dimension of love, hope, and togetherness which only a sibling can bring.